1861–IN THE BEGINNING (Part II continued). On July 1, 1862, when the nation was beset by the stress of the Civil War, President Lincoln signed a bill entitled “An Act to aid in the construction of a railroad and telegraph line from the Missouri River to the Pacific Ocean, and to secure to the government the use of the same for postal, military and other purposes.” The final enactment of this Pacific Railroad Bill was the end of a long, vexatious, and at times apparently hopeless struggle. It was during this time of tribulation that Freemasonry blossomed forth. Records of 1863 reveal that there were about 6,000 members in California Blue Lodges. 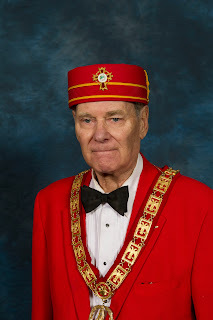 Scottish Rite Masonry had only a small representation and was not yet organized. The Supreme Council met at Charleston, South Carolina, Thursday November 16, 1865. At the meeting Albert Pike, 33 Degree, Sovereign Grand Commander, expressed his desire for the election of an Inspector General for California. Albert G. Mackey, 33 Degree, Grand Secretary General, proposed Ebenezer Hamilton Shaw, 32 Degree, as an Active Member of the Supreme Council for California. Shaw was then elected and invested with the dignity of the 33 Degree and rank of Sovereign Grand Inspector General for California and an Active Member of the Supreme Council for the Southern Jurisdiction. The Supreme Council met in Washington, D.C. on April 16,1866, at which time Shaw proposed Alexander G. Abell of California for Honorary Membership. On April 21, 1866, Shaw was authorized to confer the 33 Degree on Abell. This being done, Abell was then appointed a Special Deputy of the Sovereign Grand Inspector General for California. The Supreme Council thus established the Scottish Rite in California and this happened five years before the transcontinental railroad was completed. Shaw returned to San Francisco by steamer, and with the assistance of Alexander G. Abell, on August 4, 1866, organized California Lodge of Perfection No. 1, with William M. Rundell as Master. This was the first regular Body of Scottish Rite Masonry on the Pacific Coast. On September 8, 1866, Ebenezer H. Shaw, 33 Degree, Sovereign Grand Inspector General, conferred the degrees on twelve brethren at Marysville in Yuba County. The charter for Marysville Lodge of Perfection No. 2 was issued on November 4, 1870. In May 1883, Albert Pike, 33 Degree, Sovereign Grand Commander visited San Jose and communicated the degrees of the Lodge of Perfection to a class that had assembled in the Auzerais House, the city’s leading hotel of the day. Little is known of the meeting; however, an old membership record card of Adolph Jacob Koch, found in the vault of the San Jose Temple, revealed that Koch received the Lodge of Perfection degrees by communication from Grand Commander Albert Pike on May 16, 1883. (End—of the beginning).